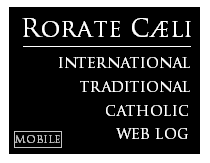 RORATE CÆLI: A new, friendly bishop in Virginia -- and a loss of influence for Cardinal Wuerl? A new, friendly bishop in Virginia -- and a loss of influence for Cardinal Wuerl? For over a year, our readers in the Diocese of Arlington, Virginia, where the traditional Latin Mass has flourished under Summorum Pontificum, have anxiously awaited the replacement of their current ordinary, Bishop Paul Loverde. Loverde is no lover of tradition, but he did, after 2007, finally get with the program, facing an onslaught of young, traditional-minded priests who were taking matters into their own hands. The anxiety came from the pervasive conventional wisdom that Cardinal Donald Wuerl would handpick the next bishop in the diocese that neighbors the Archdiocese of Washington. But with the announcement this morning that the bishop of Raleigh, North Carolina, Bishop Michael F. Burbidge will be installed in Arlington, the question is: Has Wuerl lost his influence? Our readers may know that Bishop Burbidge has, by most standards, embraced Summorum Pontificum in his diocese. 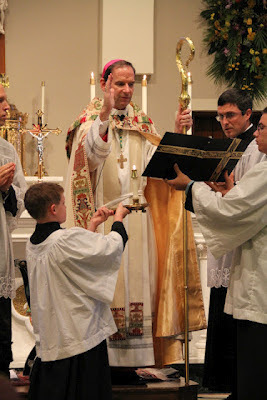 Bishop Burbidge confirms youth in the traditional Latin rite. 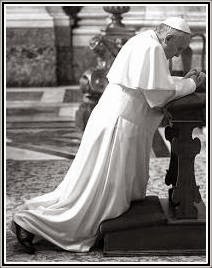 He has offered all the sacraments, including confirmation (something Wuerl has refused to allow in Washington, D.C. for the last 9 years, and has been cancelled for 2016 in Arlington). The number of Sunday traditional Latin Masses has grown and there's even a 1st Sunday TLM in the cathedral. As many have told us, he had a major mess to clean up when he arrived thanks to his predecessor, and he took Summorum and ran with it. Bishop Burbidge will still have some "cleaning up" to do in Arlington. Finding a daily TLM is still next to impossible for most in the diocese. And, while traditional confirmations did start in 2014 before being stopped with the pending replacement of Loverde this year, children had to be at least 13 before being allowed to receive the sacrament -- much too old for most traditional parents to permit. His Excellency would be good to encourage a daily TLM, confirmation for prepubescent children who need the armor of God and, importantly, to welcome a fully traditional order to start a personal parish in the diocese. While very good news for this diocese, many are already asking: How did this happen? To say the majority of conservative priests in the diocese have dreaded this announcement would be a gross understatement. They have feared the heavy hand of Donald Wuerl for a long time, and few will chalk this up to him having a changing of heart. This may give a sign of hope to neighbors in Washington, D.C., who have suffered decades of the worst of the worst at the helm, where heterodoxy and apostasy abounds and nearly no improvement has been realized post-Summorum. Cardinal Wuerl submitted his letter of resignation last November.